North Korea's reclusive leader Kim Jong-il has welcomed South Korean President Roh Moo-hyun to Pyongyang for a historic summit. Live television footage showed the two men shaking hands ahead of three days of talks in the North Korean capital. The summit between the two leaders is only the second such meeting in more than 50 years since the Korean war. President Roh said he was aiming for a "peace settlement together with economic development". The 1950-53 war between the two sides has never formally ended, but Seoul has promoted hopes for a permanent truce. It says this summit may pave the way for that historic step. President Roh left the South Korean capital, Seoul, in a motorcade along with business leaders, bureaucrats, poets and clerics. The convoy stopped at the demilitarized zone to allow the president and his wife, Kwon Yang-sook, to cross into the North on foot - the first time a South Korean leader has ever done this. They stepped across a yellow plastic tape, printed with the words "peace" and "prosperity". "I do hope after my crossing that more people will follow suit," said President Roh at the border. "This line will gradually be erased and the wall will fall." Arriving in Pyongyang, he was greeted by Mr Kim, who was wearing his trademark khaki jumpsuit, in front of crowds who cheered and waved paper flowers. Mr Roh has now gone to a state guesthouse where he will stay for the course of the summit. He is expected to hold formal talks with Mr Kim on Wednesday. The two states' only other summit was held in Pyongyang in 2000. 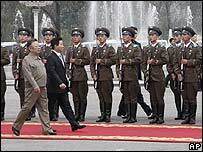 At the time, Kim Jong-il promised to make the return journey to Seoul, but that has never happened. 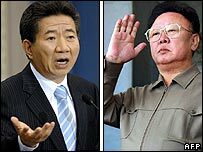 The first summit led to the former South Korean President Kim Dae-jung winning the Nobel Peace Prize for his "sunshine policy" of rapprochement with the North. Since then, rail and road links have been built, although there has only been one, symbolic border rail crossing. Families divided between the two countries have also been granted reunions, if only briefly. But critics say the South's attempts at friendship and large donations of aid have failed to break down the impoverished North's isolationism or improve its human rights record. Some observers doubt whether Kim Jong-il has any appetite for reconciliation, says the BBC's John Sudworth in Seoul. They believe he prefers to keep his military threat to coax further economic aid and other concessions from the nervous South, our correspondent says. The South Korean leader, meanwhile, has been accused of using the summit to boost his popularity. Mr Roh is approaching the end of his term of office and the conservative opposition are leading in opinion polls ahead of elections in December. They have warned Mr Roh against making any "naive" economic concessions just for the sake of an agreement. "They must know that an emotional approach to the North would bring on disasters," spokeswoman Na Kyung-won said. No official agenda has been announced for the talks, but one item that is not expected to be discussed is North Korea's nuclear weapons programme. That is being left for ongoing multi-party talks, which made significant progress over the weekend. A joint statement setting out the next step in the denuclearisation progress was agreed, and has been sent for approval to the six governments involved, including the two Koreas.